Professional ground sheet for intensive use. A ground tarp is a crucial part of tents. By using a ground tarp, it goes without saying that the inhabitants of the tent are not bothered by pests or wet soil, for example. This also makes cleaning the tent a lot easier. Whether you have a small or a large caravan tent, in both cases buying a ground sheet here at Dekzeilenshop.nl is highly recommended. In any case, we make it possible for our customers to order a ground tarp that is of a very high quality and also has a more than accessible price tag. Also buy a ground tarp? Do not wait any longer and get them today at the best possible price here at Dekzeilenshop.nl! One of the most important characteristics of a ground tarp is of course that it is waterproof. It goes without saying that you absolutely don't want to have to deal with wet feet or worse during an overnight stay in your tent. If you choose to order a ground tarp here at Dekzeilenshop.nl you can always count on it to be perfectly waterproof. This means you can always count on a truly comfortable overnight stay without you or your gear getting wet by water that rises from the ground. As far as waterproofing is concerned, the ground tarp from the range here at Dekzeilenshop.nl are very good. There is a considerable difference in strength between the different ground tarps on the market. At first sight, this may not seem like such a big problem, but it does mean that it cannot be used with all tents. When you buy a ground tarp here at Dekzeilenshop.nl this is not the case. Our ground tarps always have an excellent quality which ensures that they can not only be used for scouting, but also for Chiro tents. 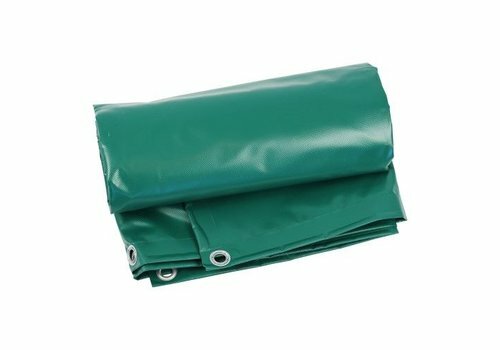 Moreover, our ground tarps are invariably equipped with a welded hem all around, while they also have eyelets every 100 centimetres. This combined with the fact that a ground tarps from the assortment here at Dekzeilenshop.nl always consists of PVC ensures that you have a really excellent ground tarp which can be used with many different tents. Ordering a ground tarp is possible here at Dekzeilenshop.nl in different sizes. You can choose to order a ground tarp with dimensions 2x3, 3x4, 4x4, 4x5, 4x6, 5x5, 5x8 and 6x8. The wide range of dimensions ensures that a ground tarp can be found in our assortment that will really meet everyone's expectations. Whether you are looking for a small or a large ground tarp, it's all possible. Moreover, most of our groundsails are directly available from stock, so you never have to wait long for your purchased ground tarps, on the contrary. These are all excellent reasons to choose to buy your ground tarp here at Dekzeilenshop.nl. The sublime quality that the ground tarp from the assortment here at Dekzeilenshop.nl have at their disposal means that many people fear that they will have to take into account a high price tag. That does not have to be the case, on the contrary. We at Dekzeilenshop.nl have not only done everything in our power to put together as extensive and diverse a range of tarps as possible, they also all have a more than favourable price tag at their disposal. This way, ordering a tarp is perfectly possible for every budget. In other words, do you not only want to be able to count on an extremely high quality, but also on a financially very accessible ground tarp? Then don't hesitate a moment longer and order them today here at Dekzeilenshop.nl! Are you planning to order one or more tarps here at Dekzeilenshop.nl? In that case you can not only always count on the best possible price for the tarp in question, in addition, your order from a minimum amount of 100 euros also completely free shipping within the Netherlands. This ensures that shipping costs will never increase the cost of your order and you can always count on the best price for your purchase.